Our flagship product is Palladium, which is used to control a sound system during performances. Palladium is able to control any item of sound equipment which has a MIDI or OSC interface, and can also control non MIDI or OSC equipment via a suitable interface such as a MIDI controlled mute or relay box. However, before actually getting to the theatre, the sound designer needs to have determined how they are going to mic their show, how many mics are required, and when those mics will be swapped between actors. This is where our second product, MicPlot, is used. MicPlot ensures all actors have microphones when they need them, while at the same time minimising the total number of microphones required for the show. MicPlot also determines the best times for any mic or pack swaps to occur, and the sound designer can specify a number of rules to guide MicPlot. Outputs from MicPlot include a wall chart showing the show and all the swaps, labels for the mics and packs, running orders for the sound crew, rehearsal tags which allow a mic plot to be tested prior to bump-in, and hand outs for each actor detailing which mic they use, who they get it from and when, and who they pass it on to and when. Both Palladium and MicPlot are very much concerned with when actors enter and exit, which is in itself a direct consequence of when the characters they are playing enter and exit. This is where our third product, Moves, is used. Moves is intended to be used by directors to assist them with their blocking, and a by-product of a director using Moves is that in the course of them using the program, they are also creating the data required by MicPlot and Palladium. However, much of the data required by Moves is based on the original script or libretto, and is thus identical from one production to the next. What changes between productions is the look of a show, where actors enter and exit from, who plays what character, and so on. Basic character data such as "Javert enters on page 17" doesn't change. That being the case, we also have a library of template files for a number of shows. Thus if, for example, a company was going to do "Les Miserables", they could go to our web-site, and download the "Les Miserables" template file. All three programs talk to each other, which means that once a Moves file has been created, this file can be imported into MicPlot, and an initial MicPlot created in about 6 mouse clicks. Similarly, Palladium is able to import MicPlot files, and again a rough cut of a show automation file can be created in about 6 mouse clicks. Generally this will require fine tuning, as it will have mics open whenever actors are on stage which may lead to more mics being open then is desirable, but it is nonetheless a good first cut. 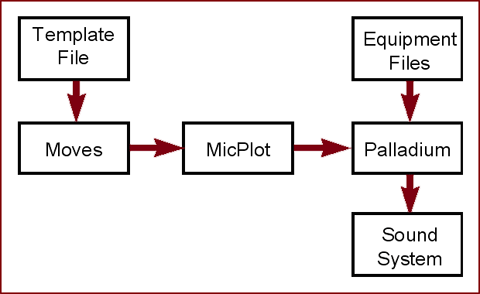 Using this process, the total time required for assigning characters to actors, generating the MicPlot, and programming the sound system should be reduced to an hour or two. MicCheck provides a monitoring solution for show's wireless mics, or indeed any other line level sources. In addition to the standard monitoring functions of allowing any combination of inputs to be monitored through a pair of headphones, MicCheck also contains a 5 second RAM recorder on every input. Thus, in the event of an extraneous sound being heard, the sound operator has 5 seconds in which to press the "freeze" button. This will then stop all recording, and switch each channel into looped playback mode. The back stage sound crew can then check each channel in turn to locate the source of the offending sound. RingMaster provides a simple and inexpensive facility for ringing on-stage telephones, and is able to generate an infinite variety of ring signals to simulate any telephone system used anywhere in the world.